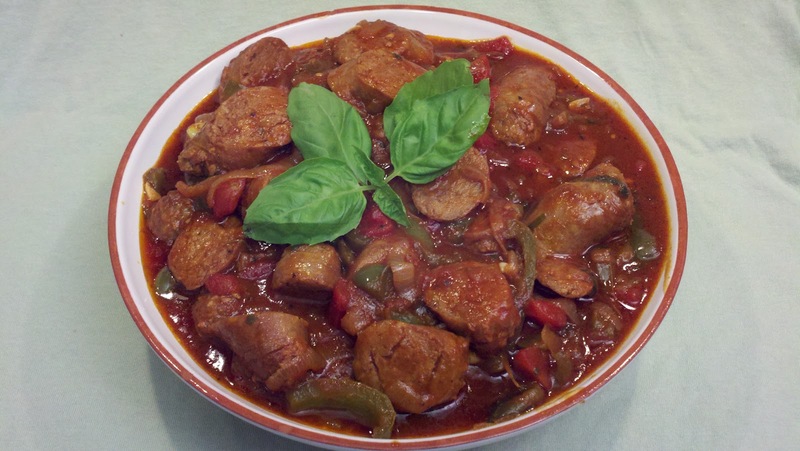 For the longest time, whenever I made sausage, peppers, and onions, I kept it simple. So simple, in fact, that I didn't add anything else. Just sauteed onions and peppers over sweet Italian sausage. Maybe some salt and pepper, but nothing else. There was always enough spice in the sausage to flavor the whole dish. Fine. Then I tried this recipe from Giada De Laurentiis. Heat the oil in a heavy large skillet over medium heat. Add the sausages and cook until brown on both sides, about 7 to 10 minutes. Remove from the pan and drain. Keeping the pan over medium heat, add the peppers, onions, salt, and pepper and cook until golden brown, about 5 minutes. Add the oregano, basil, and garlic and cook 2 more minutes. Whenever I cook sausages in a pan, I always like to go low and slow. Make sure your heat isn't too high and just let them do their thing in the pan. Then every so often, give them a turn. They'll cook much more evenly. The same is true for the peppers and onions. If the heat is too high, you'll brown everything too quickly instead of really bringing out the sugars and letting them caramelize. I also like to let it simmer over a really low heat for a while longer than the recipe directs. I just think it tastes better! I used regular sweet Italian sausage instead of turkey sausage, and I used regular green bell peppers instead of the red. I'm sure that any sausage (hot or sweet) and any color of bell peppers would work perfectly fine. If you don't have Marsala wine, you can substitute whatever kind of wine you like. You could even just add chicken broth instead. It won't be exactly the same, but it'll still be delicious! Instead of serving this on sandwich rolls, try serving it over any cut pasta, such as rotini. It's heaven on a plate! !